It's been a long time since I've used a rangefinder. My first camera was one, a little Minolta. It was a 35mm camera. I remember when I got it I wanted an SLR. I thought I would prefer focusing on the full image rather than aligning the "dots" in the viewfinder. When I first got it the dots were a bit of a challenge. This approach seemed indirect and abstract to me. I was about 8 years old. I got used to it though. I'll have to see if I can find it. My second rangefinder was a Rolleiflex, medium format. It was a hand-me-down. I looked up the serial number; it was made in about 1945-46. The Rolleiflex was quite a different experience. There were not dots to align; one focused the image. I liked that. But there was no viewfinder, rather one looked down through the view screen. The image was up-side-down It was a very different interaction than looking through a viewfinder. I preferred looking through the viewfinder, but I liked the idea of focusing on the image. I also liked the large format. Although it was square. My penultimate camera was (and still is) a micro-four thirds style. Not an SLR, but it does have a viewfinder and you do focus on the image, not some dot. It also has autofocus. It is a nice camera, lighter and less bulky than most SLR, or DSLRs. Body and lenses too. Yet, the sensor size is smaller. 2/3s the size of many DSLRs and 1/2 the size of a full-frame camera. The sensor size is partially about the image quality, but also about the effect that one can get with a larger sensor. Now I'm back to a rangefinder. It has a viewfinder. It's full frame. It has a dot to focus on; may be two if you count the one on the front. I read some fellows best practices and he said two things:  alway shoot wide open  for indoor shots shoot at ISO 800; for outdoor ISO 160 or 200. The provider of that advice notes that while the lenses of many manufactures achieve optimal performance at 2 to 3 stops above their widest opening, Leica lenses perform across the scale. There may be some dispute here, but for argument's sake I'll accept it. Setting these two adjustments leaves only one variable: the speed. This mode will drive a specific character and style of photography. I always wondered why people who shot with these types of cameras shot people, street scenes and often in black and white. May be the best practices above explain it. I've only had the machine for a week or so. May be later on I'll have confirmation. But I will say I have urges to do the same. May be its nostalgia. My reference point for this comparison is a Micro Four-thirds (M 4/3) standard camera, specifically the Panasonic DMC-G1. Cameras in this class compare favourably against the larger cropped and full-framed Canons and Nikons. Favourable in terms of size and weight and only favourable if you believe a smaller size and lower weight is preferable. One of the arguments of the M4/3 community is that a smaller sensor allows a smaller body and lenses. It all sounds very logical, until one sees the Leica M9. A full-sized sensor with a body of comparable size and smaller lenses! How could that be? A Canadian quarter sets the reference point. Panasonic Lumix G 45-200 (right). This shot was taken in each lens' most compact form, typically used for travel. The difference in size is so dramatic to be almost shocking. But after the shock wears off then one starts to think if Leica can package a full-frame sensor into a small package then why can't the larger manufacturers like Canon and Nikon? Sony has already started with the NEX-3, but they have factored it into a consumer product, not one that offers the controls a professional would like. I expect that they will come, and when they do, what will be the advantage of the M4/3 system? The Rand Corporation recently published a monograph on cyberwarfare Cyberdeterrence and Cyberwar (240 pages). Cyberspace is its own medium with its own rules. Cyberattacks, for instance, are enabled not through the generation of force but by the exploitation of the enemy’s vulnerabilities. Permanent effects are hard to produce. The medium is fraught with ambiguities about who attacked and why, about what they achieved and whether they can do so again. Something that works today may not work tomorrow (indeed, precisely because it did work today). Thus, deterrence and warfighting tenets established in other media do not necessarily translate reliably into cyberspace. Such tenets must be rethought. The research was commissioned as a result of the Air Force's new responsibilities in cyberspace: "The establishment of the 24th Air Force and U.S. Cyber Command marks the ascent of cyberspace as a military domain. As such, it joins the historic domains of land, sea, air, and space." The report includes a few tidbits, such as: "Every digital cellphone can be a door into cyberspace" [and thus the host for a 'bot']; "the divergence between design and code is a consequence of the complexity of software systems and the potential for human error"; "They [cyberattacks] are better suited to one-shot strikes (e.g., silence a surface-to-air missile system and allow aircraft to destroy nuclear facility under construction) than to long campaigns..."; and to put the whole question into context the report states "no one has yet died in a cyberattack." "With cyberattacks the opposite is more likely. As systems are attacked, vulnerabilities are revealed and reported or routed around. As systems become more hardened, socieities become less vulnerable and are likely to become more, rather than less, resistant to further coercion." Makes one wonder if the persistent and unrelenting attacks on Windows are not a part of some broader sub rosa vaccination scheme. Apparently, Mac owners are liberal snobs. Who would have known? So, if String Theory says there can only be 10 dimensions, and M-Theory says there are 11 ... which is right? Answer: it's all theory. A cautionary note: The video linked above has received fairly widespread attention, much of it questioning it's validity. As a result I questioned whether I should publish this. But in the end, I decided that this entry is a breadcrumb on my journey to understanding. The question is why are there three dimensions; why not more or less? Is there some natural preference in the universe for three dimensions or is it some cosmological accident? Sting theory suggests more; 10 to be exact. But where are they and how come we can't sense them? And what is so special about the three we are able to sense? Lisa Randall discusses these questions in Why do we live in a Three-Dimensional World, Seed Magazine. Einstein tried to develop the unified theory of the universe; one theory that explained everything. He never did. In this 50 minute documentary Parallel Universes, the BBC explains the theory relating the existence of parallel universes called M-Theory. Some believe this is the goal that eluded Einstein. In the 1980's String Theory evolved to say that matter is not simply a particle, but rather it is in the form of strings. To validate the theory there was one critical test. The hope was that Big Bang and String Theory would complement each other: Big Bang would explain the beginning of the Universe; String Theory the matter in it. But after 10 years of work, the two could not be merged, and worse yet they began to self-destruct. First, the theories could not explain the singularity which marked the initial instant of the big bang. It was at that point the known laws of physics broke down. The equations blew up. Next, rather than there being one unifying String Theory new ones emerged, eventually coming to five different theories. A competing theory, Super Gravity, which had been supplanted by String Theory, was very similar except for one point. While String Theory described a universe of 10 dimensions, Super Gravity added one to make 11 dimensions (10 spacial, and 1 time). When String Theory added the extra dimension, the five different theories collapsed into one. They were in effect five different manifestations of the same underlying theory. With the added dimension, the strings stretched and combined into a membrane, resulting in what was called M-Theory. Continued research began to suggest that there was not just one single membrane, but many. Some of these were like rubber sheets, some were three-dimensional, some were donut shaped, etc. It became apparent that each membrane was another universe each with its own laws of physics. All these Universes where floating around in the 11th dimension. But to explain the Big Bang more was needed. The theory was augmented to describe this 11th dimension as a very turbulent place. Like bubbles floating in heavy seas, sometimes these universes collided. It was when two universes collided that a singularity was formed to create a big bang and a new universe. So, as the theory goes, while we may live in a single universe, ours is just one of an infinite number in the multiverse. The program ends with a startling question: is it possible to create a universe in the lab? Those interviewed speculated it could be done. Now what would that mean? Richard Dawkins asks the question whether we can understand things beyond our evolutionary context. Are there concepts that we cannot grasp. He first positions us, humans and other animals, as existing in the middle-sized world, that world between the atomic scale and the astronomical scale. By having evolved in this middle-sized world our bodies have come to interpret and understand the physical world presented to us in this scale. What we see of the real world is a model of reality constructed by us to interpret and survive. Each animal in the middle-sized world will construct their own model to survive the conditions they face. The nature of the model is defined by how it is to be used, not so much of how well it reflects the reality. As such, realities that exist outside our model's scope of interpretation are difficult, if not impossible for us to grasp. So much for thinking outside the box. Perspective-Based Architecture (PBA) is a method developed by Lewis Curtis, George Cerbone and Ryan Plantm of Microsoft Corporation. What are good questions to ask when making good, discriminating architectural decisions? How do I promote cohesive, well-thought-out decisions decisions being considered on my project? The method has evolved from examining the conduct of successful senior architects. It has been observed that they usually posses three fundamental capabilities: knowledge, experience and perspective. Knowledge and experience are well-known and understood. However, perspective requires some explanation. Perspective represents a frame of understanding that enables the architect to understand the impact of the decisions proposed on the environment. This is the most difficult of the capabilities to acquire, and thus is the focus of the PBA (and hence the name). What are the other systems? what are the standards? What are the time/financial pressures, etc. What are the strategic goals? What is the customer market? What is the political environment, etc. What is the currently utilized solution? What are the non-functional requirements? What are the project constraints? What are the corporate trends? What are IT environment trends? Industry trends, etc. While a senior architect looking at the above may remain unimpressed, for someone new to the game, such a list of questions represents a solid baseline of learnings. For those of us approaching the retirement corridor, is provides a training tool for those who may succeed us. This 48 minute, Channel 4 (UK), documentary covers the state of the reporting of the war in Iraq. While we all hear of the number of people killed each day, the details of the terror--the personal impact on daily life--are not conveyed; any images we do see are abstracted to wide scans of cityscapes, sanitized of the blood and broken bodies on the streets below. There are a number of reasons for this, including: news agencies desire not to offend the public and governments' desire to maintain public support. With the situation in Iraq it is next to impossible for foreign reporters to leave the secure area of the "green zone"; any footage is usually collected by local reporters. As a result the foreign correspondent is disconnected and unable to provide an independent analysis of the situation; unable to answer basic questions such as why is there an insurgency? The foreign correspondent is left to convey the information provided to him from the only source available: the military. The key message: if the audience is not able to get a sense of the reality--the consequences are not fully explained--then how will we ever stop war. This two-part documentary summarizes the 700-year occupation of Spain by the Moors starting in 711AD. The story told is one less of a military occupation, but of the ascension of knowledge. 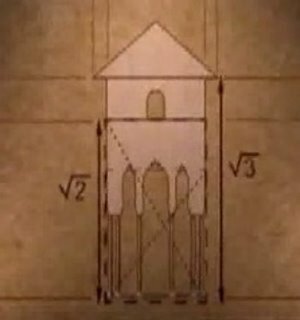 The documentary starts with a description of the mathematics behind the Alhambra, notably the ratios of the roots of 2, 3, 4, and 5. And while the inhabitants of the Iberian Peninsula where changed, so were those who invaded. The Arab mind was changed by the richness and opportunity of a fertile country. The documentary suggests that the Renaissance was started in Spain, rather than Italy, and specifically in Toledo. The documentary touches on some of the many contributions of the Moors to European culture, including many of the words we use today, such as chemistry, algorithm and cypher. And while Isabella and Ferdinand may have tried to remove the Muslim from Spain through the Spanish Inquisition, the culture and its influences remain, even today. This 57 minute documentary summarizes some of the inventions and discoveries of the ancient Arab world. According to the documentary this list includes determining the tilt of the Earth's access, the scientific method, the windmill, and the three-course meal. But may be the most important contribution was knowledge: the translation of thousands of ancient Greek works into Arabic that survive to this day. Terry Jones, writer and historian, best known for his work with the surreal comedy troupe, presents The Story of 1, a one-off BBC One documentary on the history of numbers in which he merges slapstick, quirky humour and learning. 59 minutes.